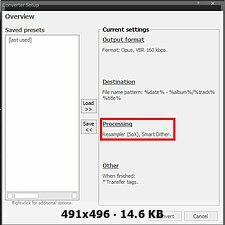 How to encode HDTracks (24/96) to Opus (16/48)? Hola! Could you tell me if this configuration in foobar2000 is the correct one to encode HDTracks 24/96 (Stereo) to Opus? Re: How to encode HDTracks (24/96) to Opus (16/48)? Remove Smart Dither. Opus (and many other lossy formats) don't have a bitdepth, so there's no reason to convert a signal to 16 bits before sending it to the encoder. for Opus codec, 160 kbps is a bit excessive if this is stereo recording. 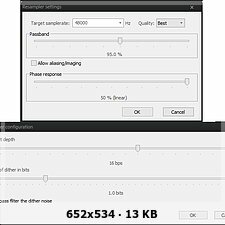 for most people 96 kbps is already transparent. I guess that depends on the motivation of the OP. 96 kbps appears to be transparent for most people with most material - but perhaps the OP just wants some additional safety margin. People that care about transferring their HD files to another format might not want to push the settings to the border of transparency. With lossy formats, in theory there's always some risk, what if the record has some parts that are undiscovered killer samples for the current version of encoder? Having a backup of original files is necessary if the OP is so serious.